They’ve got our tagline. They’ve got our talking points. They’ve even got our government private sector handshake logo. Check out the ALEC Exposed Wikipedia page for everything you need to know about ALEC and its proposed legislation! The Arizona SB 1070 legislation has sparked great enthusiasm from many other state legislators who want to pass similar immigration laws. But is it not curious that Nashville had an unusually large influence on this controversial Arizona law? CCA, also known as Corrections Corporation of America, is a Nashville based company that owns prisons and detention centers. Managing more than 60 facilities, the CCA is now the largest partnership corrections company in the United States. 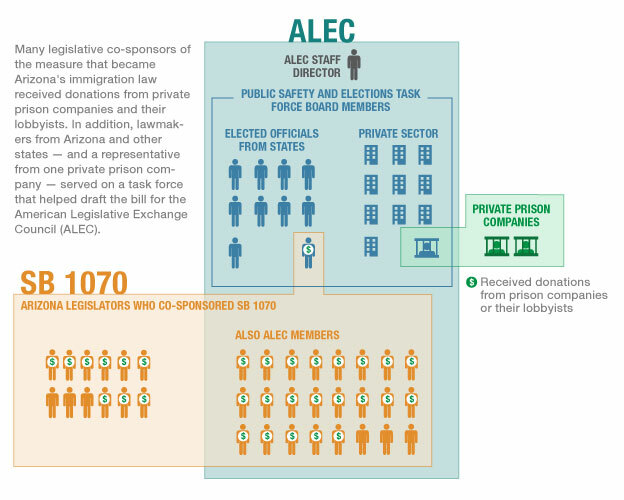 The private prison companies owned by CCA received donations from corporations and lobbyists that were members of ALEC, the conservative fiscal reform organization who drafted Arizona SB 1070. One of the founders of CCA is none other than T. Don Hutto, whose Texas for-profit detention center by the same name was infamous for subjecting immigrants to inhumane conditions. Since 2008, NPR has been working to shed a new light on the corrupt relationship between the SB 1070 legislation, private detention centers, and the American Legislative Exchange Council (ALEC). Check out these great articles and radio transcripts to learn more about the unethical handshake between the government and the private sector. You are currently browsing the archives for the Follow the Money category.